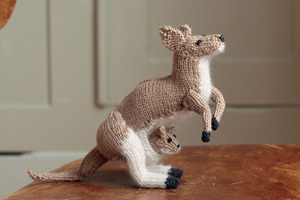 Unique to Australia, the kangaroo has powerful hind legs, large feet for leaping and a long, muscular tail for balance. Kanga is a kindly character in A. A. Milne’s Winnie-the-Pooh. Her joey is Roo, a playful and energetic friend to Tigger, the tiger. Kangaroos live happily in groups, called a mob, and during the mating season the males ‘box’ over the females to see who is going to sire the most joeys. Young joeys box too, but in a playful way.